In 1987, Lucasarts (well, Lucasfilm) released Maniac Mansion, a game that would revolutionise PC adventure titles with its innovative "SCUMM" menu system. 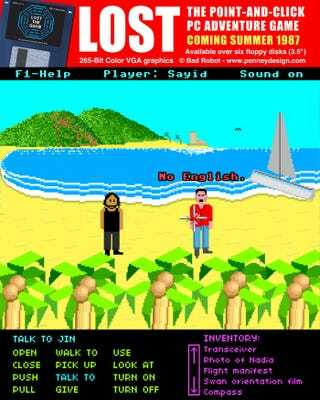 This is what the world would look like if that game had been based on TV series Lost. Yes, it's another Lost gaming thing, but non-fans need to know this show holds a very special place in many people's hearts. Like Star Wars, or a Valve game. So these kind of outpourings are not only to be expected, we should expect them for years to come. As someone who watched the first season then gave up, I also appreciate the fact I get most of these. People say things like "smoke monster" and "Dharma" and my eyes just glaze over, like I'm deaf and you're speaking Spanish. Underwater.